Should we restore or protect, on land or in the sea, to best benefit marine ecosystems? The optimal decision will vary in different social-ecological contexts. We provide some rules of thumb to help with decisions. 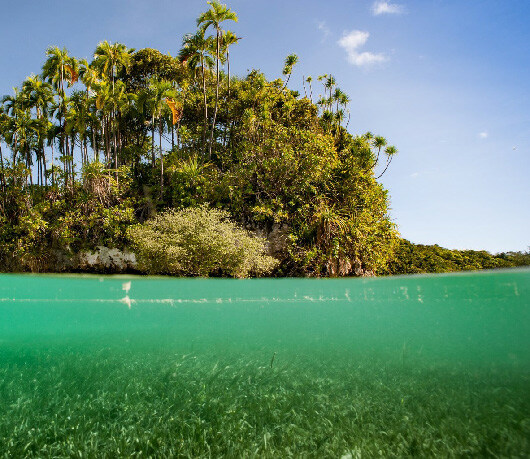 Coastal ecosystems like seagrass, coral and mangroves occupy the narrow fringe of sea between the land and the deep ocean. As such they provide easy access to the marine world – they are shallow, close to shore, and relatively calm places compared to the open ocean. These same features also make coastal ecosystems vulnerable to human activities – activities occurring both on land and in the ocean. Consequently, these ecosystems pose a number of challenges to managers. When it comes to getting the best outcomes for these coastal marine ecosystems, should we be investing limited conservation budgets in actions on the land or in the ocean? Conventional wisdom is that the most effective conservation actions to benefit coastal marine ecosystems involve the implementation of marine protected areas, or alternatively, a reduction of land-based threats. Active marine restoration, on the other hand, is typically considered a low priority option. This is due, in part, to high costs and low success rates. To help managers better understand the trade-offs, we developed a model that compared restoration to protection, on either the land or in the ocean. The aim is to maximise extent of coastal marine ecosystems. We based the model on seagrass meadows and adjacent catchments in Southeast Queensland. In our model, the riparian vegetation in the landscape, the presence or absence of which is a major determinant of sediment erosion to the coast in the region, is divided into four categories – intact and protected, intact and unprotected, cleared, or in restoring condition. This is based on work by Hugh Possingham and colleagues (Possingham et al, 2015). In our analysis we extended the approach to include the adjacent seascape, which in our case study consisted of seagrass meadows. The marine ecosystem was divided into the same four categories, with a fifth category for areas of the ocean which are unsuitable for seagrasses due to low light conditions. The area of ocean that is too murky to support seagrass changes in each time-step as a function of the proportion of the landscape that is cleared, and thus a source of eroded sediments to the ocean, vs intact riparian habitats, which protect against erosion. Surprisingly, we found that despite its high cost and low feasibility (see Decision Point #95) direct active marine restoration can be the most cost-effective approach to maximising extent of marine ecosystems over decadal time-scales. 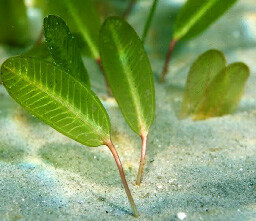 This assumes that there is suitable habitat available for restoration (defined as planting seagrass transplants); clearly, if suitable habitat does not exist, for example due to poor water quality, then other actions would take priority. 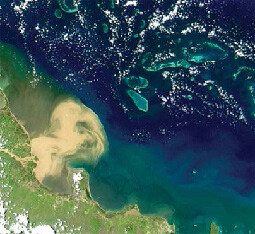 A satellite image of the Burdekin River flood plume in 2008 spreading from the coast out into the Great Barrier Reef lagoon. When prioritising investments, incorporating the connections between land and sea is important. (Image by NASA). There is substantial uncertainty in our understanding of the dynamics of complex linked land-sea ecosystems, several assumptions underpinning our model, and a large degree of uncertainty exists in some of the model parameters. Further, geomorphological and ecological conditions vary geographically. The model can in theory be applied to other regions, but it is not straightforward to parameterise. Therefore we used the model to investigate how uncertainty in key parameters affects our decision making. (4) land protection should be prioritised if the catchment is relatively intact, but the rate of vegetation decline is high. These rules-of-thumb illustrate how cost-effective conservation outcomes for connected land-ocean systems can proceed without complex modelling. Possingham HP, M Bode & CJ Klein (2015). 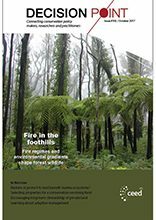 Optimal conservation outcomes require both restoration and protection. PLoS Biol 13: e1002052.